In the past years the Viareggio (Italy) based yard Fipa had constantly developed its range of 20 to 30 meters prestigious yachts, thanks to both employees and management philosophy. All this is reflected to the new Maiora 25, a yacht mixing technology, innovation, luxury, performances and top class habitability: a real yacht design state of the art. With a remarkable know-how, Fipa designs and build superiors motor yachts, always within specifications and delivery time, according to client's requirements (satisfying them and encouraging them as well), with an unique style throughout every boat's centimeter. On deck, for example, the fitted accessories number is amazing, and every detail is outstanding regardless it is on the flying-bridge, deck or cockpit, achieving almost perfection. 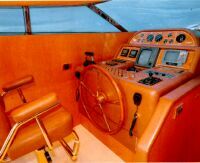 The Maiora 25 flying-bridge features an elegant design (probably the boat's "particular sign"), high quality fittings and a technical, logical and elegant steering station. The fore deck is beautiful with a fully hidden Jacuzzi pool underneath the large sun-lounge. 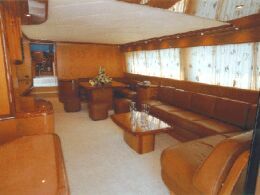 The main saloon has the living area and the dinning area smartly divided and elegantly connected to the navigation bridge, where an impressive main electrical board and a "C" shaped dinette are fitted. 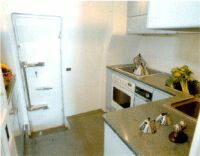 The completely enclosed galley feature a door to the saloon and a door to the outside port walkway. 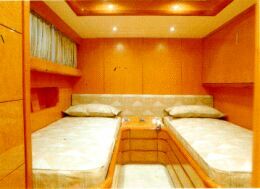 The underdeck lay out includes: owner's cabin, two guests' cabins and a VIP cabin. According to Fipa philosophy all fittings and joiner works are to highest standards. 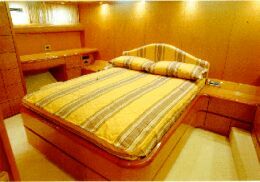 Performance, then, are outstanding and emphasized by the boat's elegance when under way. The Maiora 25 has an extremely complete standard equipment; the boat's construction length, kept under 24 meters, is remarkable for the European market. 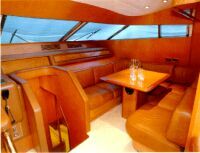 The prospective owner will find on this Maiora 25 features and facilities over and above the expectations, as expected on boats of this class. This is an excellent product where no particular has been overlooked and left to the last moment solution, which will surely add luster and credibility to the Italian yacht industries. Average miles range, at a given rpm, is obtained dividing the total fuel capacity (8000 liters) for the "liters/mile" corresponding to the entered rpm. Plotted fuel consumption is declared by the engines' manufacturer: tuning of the engines, weight of persons, stores, etc... on board, hull conditions and propeller type can effect the real fuel consumption. 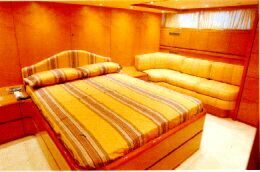 Lay-out and main features: owner's cabin with bathroom and TV - radio system; day bathroom; two guests' cabins with two plus one beds and bathroom with shower each; one VIP's cabin with bathroom and shower; crew quarters with two cabins and bathroom with shower; dinette to the opposite dashboard's side; spacious main saloon divided into dinning and living areas, 8 to 10 people dinning table with cupboard unit, sofa with table, TV - stereo system.